The Edible Map of Dallas covers 110 acres of central Dallas. It explores the potential for urban agriculture in the neighbourhood, imaging food production is an everyday occurrence. The map forms part of a vision for Dallas that aims to develop, support, and create a food secure city, and improving access to healthy food for every city resident through urban agriculture. The main aim of the edible map project was to engage the city and landowners with the potential of urban agriculture centred on the needs of refugee populations, which dominate the area. It was a challenge to create this Edible Map because the walking aspect of the research conflicted with Dallas as a motor-city … nobody walks. This is an ongoing mapping project, currently developing into practical projects in several sites across Dallas. Urban Agriculture is the practice of relocalising food production in and around urban areas, providing local jobs, drawing on urban resources and waste streams to supply part of the daily food requirements of a given city. 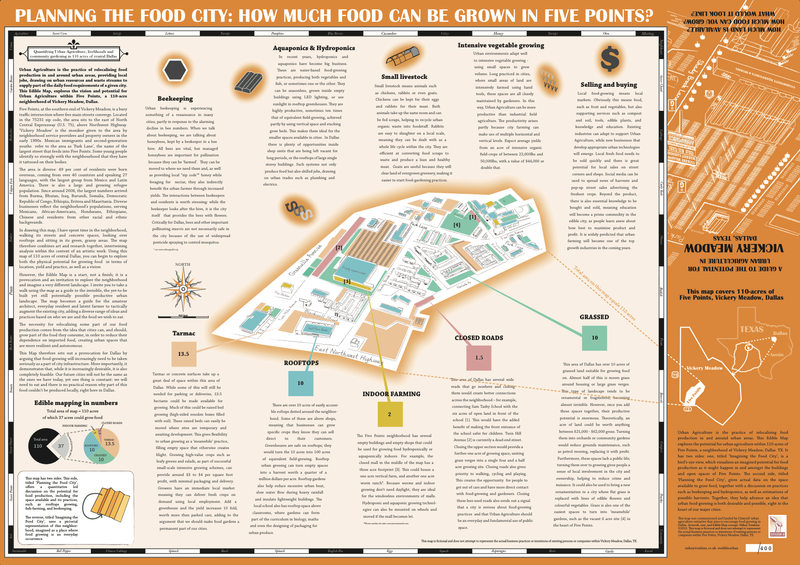 This Edible Map, explores the vision and potential for Urban Agriculture within Five Points, a 110-acre neighborhood of Vickery Meadow, Dallas. Five Points, at the southern end of Vickery Meadow, is a busy traffic intersection where five main streets converge. Located in the 75231 zip code, the area sits to the east of North Central Expressway (U.S. 75), above Northwest Highway. ‘Vickery Meadow’ is the moniker given to the area by neighborhood service providers and property owners in the early 1990s. Mexican immigrants and second-generation youths refer to the area as ‘Park Lane’, the name of the largest street that feeds into Five Points. Some young people identify so strongly with the neighbourhood that they have it tattooed on their bodies. The area is diverse: 49 per cent of residents were born overseas, coming from over 40 countries and speaking 27 languages, with the largest group from Mexico and Latin America. There is also a large and growing refugee population. Since around 2008, the largest numbers arrived from Burma, Bhutan, Iraq, Burundi, Somalia, Democratic Republic of Congo, Ethiopia, Eritrea and Mauritania. Diverse businesses reflect the neighborhood’s populations, serving Mexicans, African-Americans, Hondurans, Ethiopians, Chinese and residents from other racial and ethnic backgrounds. In drawing this map, I have spent time in the neighborhood, walking its streets and concrete spaces, looking over rooftops and sitting in its green, grassy areas. The map therefore combines art and research together, intertwining analysis within the context of an artistic work. Using this map of 110 acres of central Dallas, you can begin to explore both the physical potential for growing food in terms of location, yield and practice, as well as a vision. Below are detailed images of the Dallas edible map.